Yep, I've just finished up another charm swap. This time was a bit different. 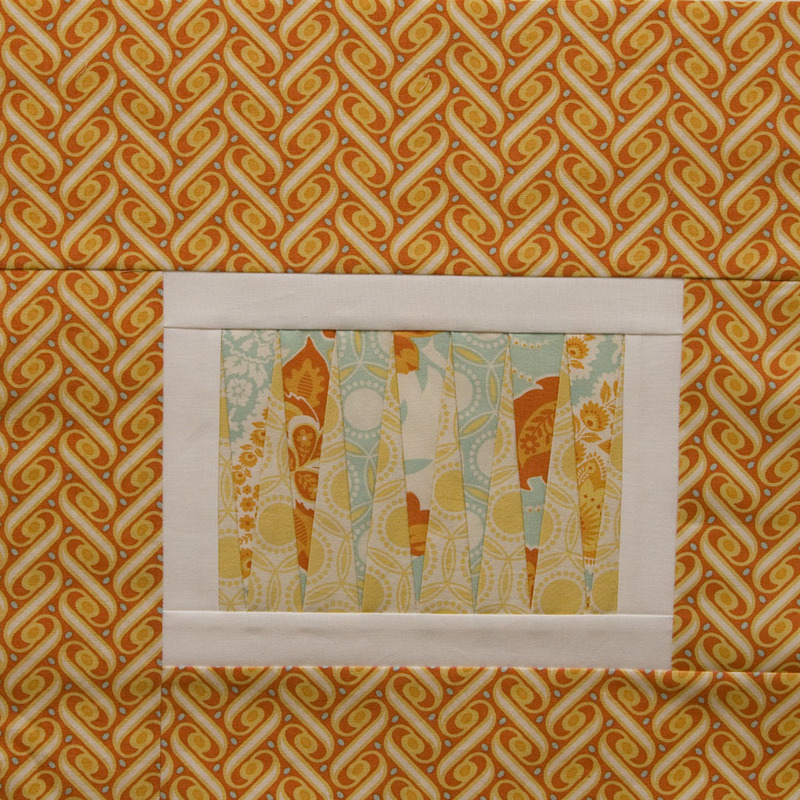 My buddy Amy asked me to host a charm swap for the participants in her 4x5 modern quilt bee. We did the colors a little different for this round. 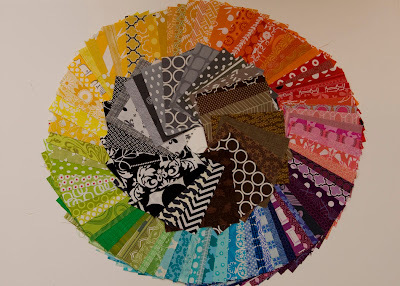 Instead of my standard color wheel swap we did basic colors (ROYGBV) and then added in the most popular colors chosen by participants for the bee (pink, aqua, citron, mustard, tangerine, black & white, grey and brown). It was a really fun swap. The three kiddos and I took 40+ packages to the post office today. Everything is officially in the mail. To reward them for being such good kiddos this morning while I packed everything up, we played this at McD's this afternoon for almost 2 hours. They were nice and tired for naps. Once I recover from this swap, I'll be gearing up to do it again. I'm a bit addicted. Here's my question for those who are interested in participating--would you prefer the basic 12 colors from the color wheel or a swap using the colors above? My sewing this week consisted of finishing up two bee blocks and that's about it. Emily asked us to design the center patchwork section with anything we'd like. 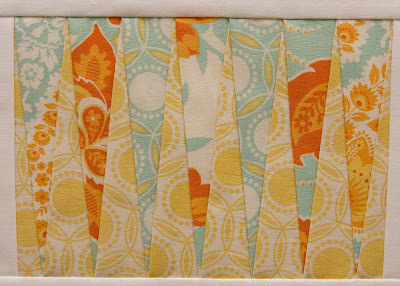 I had New York Beauty blocks in mind when designing this paper piecing section. Finally, don't forget the link-up next week for Slash the Stash. Get working on those projects. It doesn't have to be something completely finished, just something you're using your stash to complete. 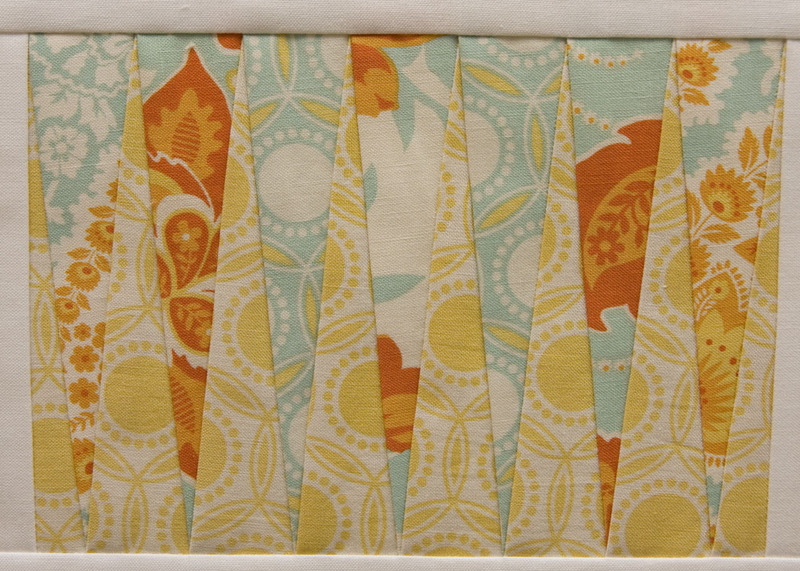 Also, we may have something fun from Brenda over at Pink Castle Fabrics! Stick around! 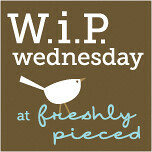 Linking up to Lee's this week. oh I want in!! i've never done a rainbow charm swap, so either works for me! Sooo exciting!!!! I actually just recently became a follower hoping you would do a charm swap again. Both color ways look great but for starters I would prefer the basic 12 colors. Love your blocks, and yes, think the kids deserve a reward after al that sorting! oooh, another charm swap, you say? either way would work for me. nice blocks too! Oh, either if you're doing it! You host fab charm swaps! Great bee blocks! Charm swap - I like the one you posted above because I like the black, white and grays too. I love my block! I can't wait to see others finish it. Love your Emily block!! And thanks again for the swap - I really appreciate all you put into it! 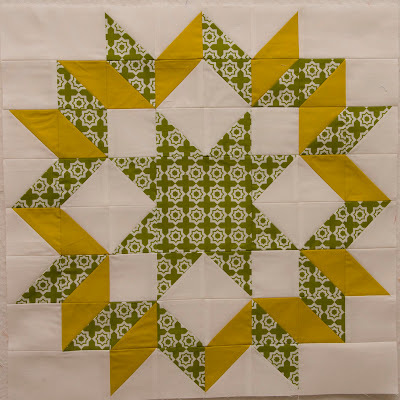 It would be fun to swap with the darker colors - so different from the color wheel swap. i would love to do it next time!, i think as you have them in the photo above. i just participated in the "Ellison lane" i spy charm swap looking forward to getting those back!. I would want to participate in either, but love the variety you show in the picture of the bee swap colors! I've been wanting to join a charm swap too so I would love to join in if you're opening it to international swappers? I'd love the basic 12, but would be happy to be involved in either!